This past weekend at NECSS 2016 we invited science journalist John Horgan to give a talk on “Skepticism: Hard Versus Soft Targets.” We’re always game for some critical introspection. It keeps things interesting if nothing else. Unfortunately the talk, which he has now published on Scientific American’s website (which means it’s fair game), was more than a bit disappointing – not because he was critical, but because he does not seem to get skepticism with a small or a big “S.” The result was a string of cherry picked strawmen. That makes you a contrarian, not a skeptic. How about telling it like it is? Most ideas and movements are a mix of good and bad, and it often takes some effort and nuance to tease this apart. Or, you can just “bash” an entire philosophy simplistically because you fancy yourself an independent thinker. There is also nothing wrong with “preaching” to the choir – it’s not about conversion, but education. I’m a science journalist. I don’t celebrate science, I criticize it, because science needs critics more than cheerleaders. I point out gaps between scientific hype and reality. That keeps me busy, because, as you know, most peer-reviewed scientific claims are wrong. Keep in mind, he titled the written version of his talk, “Dear “Skeptics,” Bash Homeopathy and Bigfoot Less, Mammograms and War More.” He is explicitly addressing skeptics and telling us what to do. When you do something like this, with all its presumption, be sure to know what you are talking about. Specifically, don’t pat yourself on the back for pointing something out to someone, as if you are teaching them something new, when they have been shouting the exact same points for years. It makes you look intellectually lazy and extremely foolish. Really – most science reporting is hype? That’s practically a weekly segment on the SGU. Most scientific claims are wrong you say? I must have missed that the first 30 times I wrote about it. This is what we “skeptics” call a false dichotomy. You can simultaneously be a cheerleader for science, advocating scientific methodology, the power of science when it is done right, and marvel at the findings of science, and criticize bad science, problems with the institutions of science, and poor science reporting. As an example, see just about any skeptical podcast or blog. This is the – don’t spend your time and effort on things you think are important, spend them on things I think are important – gambit. “Soft targets” are things that Horgan does not think are important, or does not understand the importance of. While “hard targets” are things he cares about, even if they reflect his personal political ideology. In fact, he was surprised that Jamy Ian Swiss brought up Bigfoot in his defense of skepticism. This is because Horgan seems to be completely unaware of the “Bigfoot skepticism” meme. This is a meme he is repeating without realizing it, hence his confusion. First, physics. 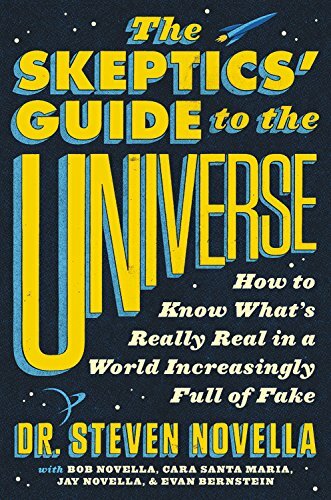 For decades, physicists like Stephen Hawking, Brian Greene and Leonard Susskind have touted string and multiverse theories as our deepest descriptions of reality. Like most of his claims, this is wrong on multiple levels. First, Hawking and others have not presented string theory and multiuniverse theories as descriptions of reality, but as mathematical models. More to the point, the exact status of these theories has been hotly and deeply debated within physics and skepticism. Horgan gives a very superficial analysis, in my opinion to the point of being wrong. He claims they are not falsifiable, therefore they are pseudoscientific, “Like astrology.” For those of you playing logical fallacy bingo, that is a false analogy. There are many problems with astrology that do not apply to string theory. The “non-falsifiable” criticism has been raised, numerous times, by skeptics, and the implications of this have been discussed at length. Briefly, it is true that string theory and the multiuniverse theory are not currently testable, and therefore they are not complete sciences unto themselves. But they do attempt to give insights into what the deeper realities of the physical universe might be by exploring mathematical models for internal consistency, the ability to explain what we already know, and elegance. They will ultimately come to nothing if we cannot find some way to test them, but that does not mean they serve no purpose now. Also, it is a contested point that they are not testable now, but I will leave that to the physicists and another day. The main point is, Horgan’s summary was superficial to the point of being wrong, and betrays his utter ignorance about what skeptics discuss and what our actual position is on the examples he gives. Physicists are even promoting the idea that our universe is a simulation created by super-intelligent aliens. Last month, Neil de Grasse Tyson said “the likelihood may be very high” that we’re living in a simulation. Again, this isn’t science, it’s a stoner thought experiment pretending to be science. Again – this is a point of conversation among skeptics, including on the SGU. Horgan’s premise is that we do not examine the statements of our celebrity scientists. Wrong again. Not only do we do that, but some skeptics will criticize other skeptics for not doing it enough or in specific cases. I also don’t think that the simulated universe was ever meant to be anything other than a thought experiment. Horgan does not understand his own examples. Horgan goes on to make the same mistake about the Singularity (and his summary is also not quite right). This is a hot point of debate among skeptics. But tests often do more harm than good. For every woman whose life is extended because a mammogram detected a tumor, up to 33 receive unnecessary treatment, including biopsies, surgery, radiation and chemotherapy. For men diagnosed with prostate cancer after a PSA test, the ratio is 47 to one. Similar data are emerging on colonoscopies and other tests. Here are almost 40 articles from science-based medicine on overdiagnosis in mainstream medicine, including several articles on mammography. The pattern should now be clear – Horgan gives a simplistic summary of an issue, showing that he himself has a superficial understanding of the relevant points, accusing skeptics of not dealing with such issues sufficiently. Meanwhile, there is already an in-depth discussion of the issue in skeptical circles, which is much deeper that Horgan’s treatment. Psychiatric drugs help some people in the short term, but over time, in the aggregate, they make people sicker. Journalist Robert Whitaker reaches this conclusion in his book Anatomy of an Epidemic. Whitaker cited evidence that antipsychotic medications make schizophrenia outcomes worse. In fact, the very evidence he cited showed that medications make outcomes better. However, shifting to a more narrow definition of schizophrenia give the illusion that outcomes are worse, because now we are only counting the most severe cases. Over the past several decades, geneticists have announced the discovery of “genes for” virtually every trait or disorder. We’ve had the God gene, gay gene, alcoholism gene, warrior gene, liberal gene, intelligence gene, schizophrenia gene, and on and on. None of these linkages of single genes to complex traits or disorders has been confirmed. None! But gene-whiz claims keep coming. This is a good example of confusing the reporting of science with the science itself, a shocking error for a science journalist. The notion that there is a single gene for a complex trait is a fiction of the media. Some scientists may oversimplify the implications of their research, or not communicate it well, but generally this is not a delusion among geneticists. Horgan finishes by talking about the hardest target of all, war. He begins by talking about the “deep-roots theory of war,” the notion that humans are an inherently warlike species. Horgan claims there “the evidence is overwhelming,” that war is cultural, but then links only to an article he wrote on one very narrow study of Japanese hunter-gatherers. This is obviously a complex topic, but I don’t think any skeptics are arguing that war is genetically inevitable. Of course there is a huge cultural component. While Horgan cites Steven Pinker as an example of the deep-roots theory, he misses the point that Pinker is also arguing that war and violence have been steadily decreasing over historical time, and that we can rid ourselves of war, partly by understanding war in the first place. While it is certainly simplistic to say that war is genetic, it is equally simplistic to dismiss human nature and argue that war is entirely cultural. It is likely both, like all human behavior, a complex interaction of nature and nurture. Horgan then clearly wanders into his own personal political ideology. This is another deep can of worms within the skeptical movement, and Horgan is opening it without giving any evidence that he is aware this is a discussion that has been raging for years among skeptics. Of course, war is terrible and we would all like to eradicate war, but how to best accomplish that goal is a complex question without a clear scientific answer, and is mired in personal ideology and values. Skeptics differ on the extent to which we should mix personal politics with our scientific skepticism. Horgan is simply taking one extreme position in this debate, unaware that the debate even exists. The big lesson here is this – if you are going to criticize a movement, discipline, subculture, science, or group from the outside, to the point of telling them what they should be doing, you should at least have a working knowledge of that group. After reading his article, it is safe to say that Horgan does not have the first clue about scientific skepticism. The result was a parade of straw men supported by cherry picked and often misinterpreted examples. Horgan also misses several important points that skeptics have already made in defense of our chosen scope. We address the full range of issues within our purview, what Horgan would call soft and hard targets, because it is all useful. Sometimes we deconstruct simplistic and obvious pseudoscience because it provides a teaching moment, so that our audience will be better able to deconstruct more complex targets. Further, some of what Horgan thinks of as soft targets are still hugely important issues within our culture. Homeopathy remains a mutli-billion dollar industry. Who is going to take it on if not skeptics? The greatest gap between scientific and public opinion is over the safety of GMOs. Again – who is slowly turning this ship around? As a movement we have a certain expertise – an expertise in pseudoscience, mysticism, denialism, the organizations that promote these things, relevant regulations when applicable, and strategies to confront them. Let us do our job, in the sweet spot of our expertise. If you think some other agenda is important, then feel free to make that your priority. Good luck to you. But please do not presume to tell us what we do and what we should do when obviously you have not invested even the smallest amount of time trying to first understanding what it is we do, or engaging with us on the major premises of your position. In short, Mr. Horgan, turn that skeptical eye onto yourself before you presume to turn it onto others. And for the record, yes, this is something we advocate that skeptics do also.